When I first heard the news, I thought it was a joke somebody is trying to pull… but it isn’t. Section 114A is real. 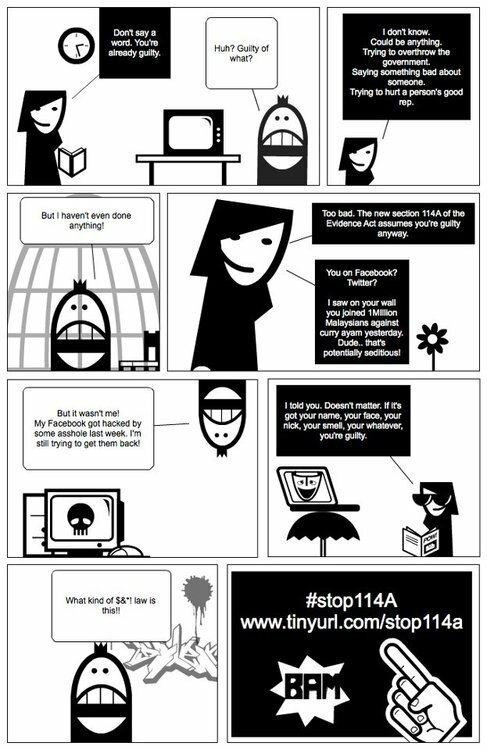 Section 114A is an amendment made recently to the Malaysia’s Evidence Act 1950 and gazetted on 31st July 2012 with the purpose of holding those that publish seditious, defamatory, or libelous content online accountable to their actions. While it seems harmless, this takes a toll on any owner, administrator, host, editor, subscriber of a network, website or digital devices. Yes, that includes just about anyone! As illustrated in the infographic, you will need to be responsible for the comments left on your blog or Facebook page as you may be penalized for what is posted by your friends, fans, followers AND strangers. This may also mean that it will be a better idea to delete these comments upon sight rather than leaving them public. Unless you have certain monitoring methods in place, it may be a better idea to no longer share your WiFi network. Doing so may risk the potential of others in utilizing your network to post defamatory remarks with you taking the blame. Similar to #2, if someone taps into your network and breaks the rules, you are to be blamed! Unless you can prove otherwise, that is. 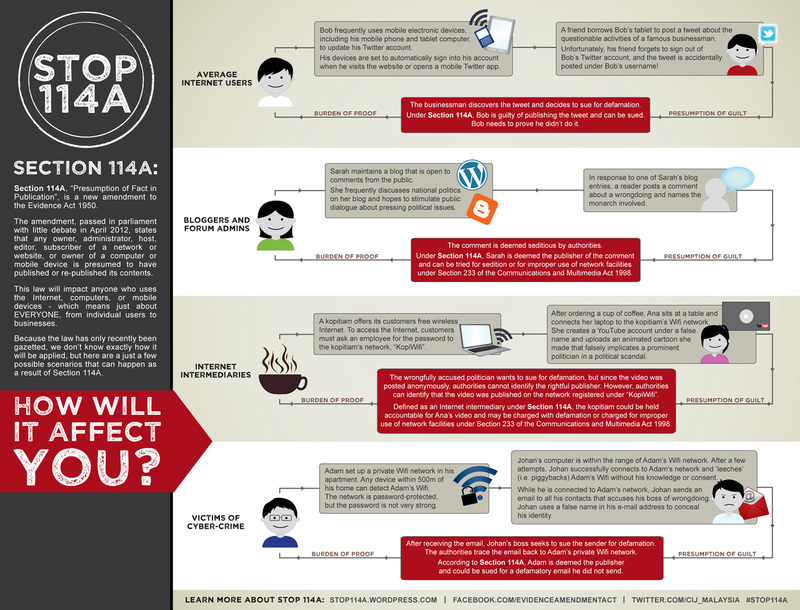 So, do we really need Section 114A? My answer is no. While I see there is a good intention behind it, it really makes no sense to penalize internet users (especially when they already are the victim). Section 114A really seems like the easy way out by saying “since we can’t catch the culprit, let’s catch the network’s owner instead”. Hi Jan,something wrong with your blog or something with my Mac, can’t view your infographic. If you ask, I would say it depends on situation. The Act is to protect government or protect anyone is attacked by other people? Greetings from Los angeles! I’m bored to death at work so I decided to check out your site on my iphone during lunch break. I enjoy the knowledge you present here and can’t wait to take a look when I get home.